LSC Lithium Corporation announced progress on key infrastructure for the Pozuelos-Pastos Grandes (“PPG”) Project. The Company has engaged with regulators and Salta based service providers to advance permitting, data acquisition and construction of key project infrastructure. Allocation of gas capacity to support electricity and steam generation for 20ktpa lithium carbonate operation. Fresh water sources identified with quality confirmed for future operations. Commencement of geotechnical investigations for ponds and plant infrastructure covering approximately 800 ha in the Pozuelos salar. Completion of exploration camp which will be converted and expanded to a future operations camp. Application submitted for permit for brine pipeline corridor connecting Pastos Grandes and Pozuelos with approval expected in Q1 2019. This will secure the planned production mix of approximately 35% of brine from Pastos Grandes and 65% from Pozuelos, providing an efficient blend. LSC has received written confirmation from the gas distribution company allocating capacity on the existing Puna and Fenix gas pipelines. The quantities are expected to be sufficient to produce electricity and steam generation for a production facility of 20,000 tpa of lithium carbonate. The intention to tie into the existing Fenix pipeline approximately 40km south of Pocitos and connect directly to the Pozuelos salar is supported by the distributor. LSC will continue this engagement to finalise technical specifications, price assumptions, and understand infrastructure requirements. The construction of a 40-person exploration camp at the Pozuelos salar has been completed and was occupied in September. The camp will simplify future exploration logistics, support the construction and operation of future pilot ponds and has been designed to be expanded for future mine operations. Once the PPG Project is moved to construction and production, this camp will be expanded and utilized for mine administration offices and as an operational camp. Three separate sources of fresh water have so far been identified across the Pozuelos salar. Fresh water at site WWF1, which is located approximately 1km from the accommodation camp, will be used to support the camp operations and future pilot plant test work. 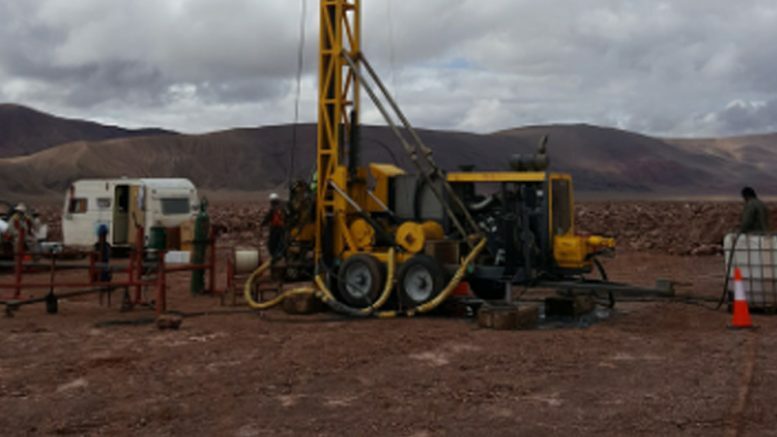 Sites PZMW01 and PZMW02 were drilled to test the brine-fresh water interface in the extreme north and south of the Pozuelos salar. The testing confirmed a conventional interface, with fresh water recharging the salar above a layer of brackish water and brine lower in the stratigraphy. The quality of water at all three sites supports water requirements for a future process plant with minimal treatment. Testing is ongoing to ascertain the long term yield potential from these wells. An application for a water abstraction permit has been lodged with the Ministry of Environment in August 2018 with approval expected before the end of the year. A first field investigation was undertaken by a geotechnical engineer to ascertain and confirm that conditions within the salar support the construction of the primary evaporation ponds which are expected to be approximately 800ha in size. Furthermore, sufficient area is available adjacent to the salar for placing the secondary and tertiary ponds, salt stockpiles and the lithium plant. A program is now being developed to confirm detail design criteria for building foundations and pond construction. LSC plans to deliver approximately 35% of raw feed brine to the evaporation ponds from the Pastos Grandes salar. A pipeline of approximately 15km in length is required to transport this brine. As 11km of this pipeline is located outside of LSC tenements, an application for an easement for the pipeline corridor has been submitted to the Salta mining authorities. This application was supported by an environmental impact assessment and baseline studies over the extent of this pipeline corridor. Approval is expected in Q1, 2019. This approach ensures that all major project infrastructure can be located in the mature Pozuelos salar, where geotechnical, environmental, physical and social conditions are better suited to the construction of infrastructure. Be the first to comment on "LSC Lithium Announces Progress on Infrastructure for the Pozuelos-Pastos Grandes Project"